Steve Goers is a freelance composer, pianist, and music director. Originally from Chicago, he now lives in Cincinnati where is on the musical theatre faculty at the University of Cincinnati College-Conservatory of Music. 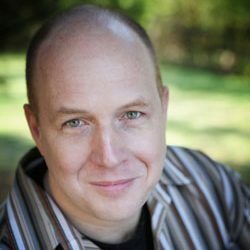 In addition to music directing award-winning musicals at CCM, he has been very active in the Cincinnati theatre community and has worked with Ensemble Theatre, Children’s Theatre of Cincinnati, the Covedale, the Carnegie, the Showboat Majestic, Cincinnati Young People’s Theatre, Ovation, Clear Stage, Performance Gallery, and NKU. He was recently honored with a 2009-2010 Season MVP Acclaim Award. Mr. Goers has composed numerous works for theater, industrial video, radio, and film including a collaboration with Chicago playwright/lyricist Alyn Cardarelli on musicals for children featuring world premiere adaptations of Where the Wild Things Are, Stellaluna, and How I Became a Pirate. Mr. Goers has toured the U.S. and Africa with productions of Barnum and Bubbling Brown Sugar and was featured as pianist and session producer on the album Ella Jenkins and a Union of Friends Pulling Together, which received a Grammy nomination for Best Children’s Album.